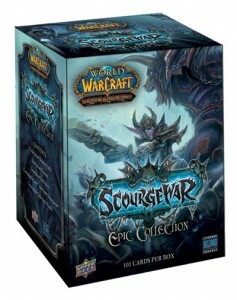 Demand outstripped supply at some of the sneak peak events last week but now the World of Warcraft TCG Scourgewar expansion set is available to everyone. Scourgewar draws on the dark mood of the Wrath of the Lich King MMO expansion, for example debuting Death Rattle as a new keyword. Another major theme of the set is making class matter. Or maybe all that matters is the included loot cards. Wrath of the LICK King?